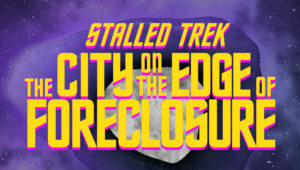 Yesterday, I turned the spotlight on a brand new Kickstarter campaign for STALLED TREK: “CITY ON THE EDGE OF FORECLOSURE.” The Kickstarter had an initial goal of $600 to cover the cost of pressing 250 Blu-ray discs to be used as perks. In an amazing show of immediate support, dozens of backers blew through that $600 goal in less that 8 hours! Now at more than double that initial goal, creator / writer / director / animator / jokester MARK LARGENT has announced stretch goals, including a special behind-the-scenes feature at the $2,000 level, and HD remasters of “Amutt Time” and his “The Wobbling Dead” parodies at the $4,000 and $6,000 levels. Those extras will be added to the Blu-ray perks that will be sent out to all donors at $25 or above. Supporters contributing less will get access to those extras (and “City…” of course) as HD digital download files. In the first part of my interview, Mark explained that the distribution of Star Trek parodies via Blu-ray perks is totally kosher since parodies qualify for Fair Use protection under copyright law. JONATHAN – So tell us a little bit about this “City on the Edge of Foreclosure” idea. How did it originally come into existence? In the very early 2000s, there was a website where you could sell digital products. I’d made PDFs of some of the comics my pal MARK McCRARY had worked on, and I also made one of “Amutt Time.” I then began working on “City on the Edge of Foreclosure” as “Stalled Trek #2.” I probably did about five pages of it when the lack of sales through the site caused us to abandon our “electronic comics” endeavor. I know I played with making it in Flash at some point later, but it was always taking a back seat to “Amutt Time.” That was the one I wanted to see finished. JONATHAN – “Balance of Terriers”…I love it! But that one didn’t get made either…? MARK – Not yet. Having never made an animated film before, I had no idea how long it would take and, with a hard and fast deadline, it became clear it was going to be a big accomplishment finishing the one in the time I had. Fortunately, I did. JONATHAN – And then you rested…for several years? MARK – Not quite that long, but it does take me a little while to recoup. “Amutt Time” was 2012, I followed that up with “The Wobbling Dead” in 2014 and in 2016 I did this little parody of a fan film that enlisted the help of a well-known blogger celebrity. [That was Prelude to Ax’d-We-Are with me -Jonathan]. It’s an even year, so I have to get back on the treadmill. Last year, I considered the idea of going the comic strip route and trying to do a bunch of episodes using the existing assets. 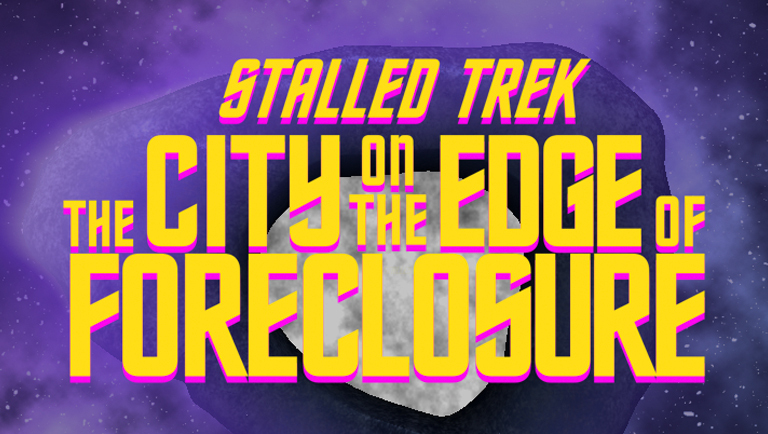 I pulled out the script for “City on the Edge of Foreclosure” and took a new pass at it. 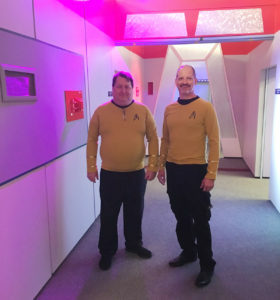 Everything was going along great until McCrary and I made a trip to Ticonderoga to see the Star Trek Set Tour last September to celebrate our upcoming 50th birthdays. 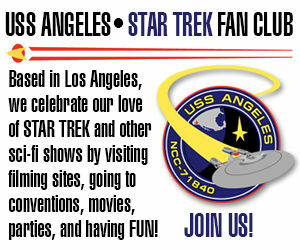 It’s a tremendously cool experience for a life-long Star Trek fan, and it made me want to start building things anew. After spending a number of months on another project that I just couldn’t figure out how to crack, I thought: I’ve got this script for “City”—let’s see if it’ll stick this time. A couple of months into it, I knew I was well on my way. City is a great subject for parody. It’s a great episode with some big ideas and big drama. 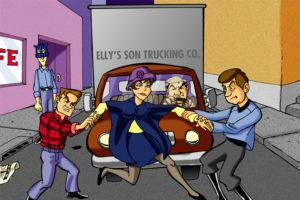 It also has a long history of controversy that many Trek fans are aware of. Much has been written about its writing and the famous feud between Roddenberry and Ellison over it, how Joan Collins famously said years later that she played a Nazi on Star Trek. There’s a wealth of stuff to make fun of! JONATHAN – Okay, let’s shift over to the stretch goals. At $2,000, you’ll add a director’s commentary. That’s cool. But at $4,000 you add a remastering of your first Stalled Trek episode “Amutt Time.” How is it that you can make a completely new fan parody from scratch for just $600, but it’s gonna take an additional $2,000 to remaster a film that’s already done? 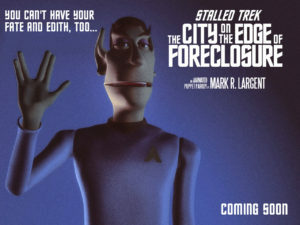 MARK – To quote Spock, “You proceed from a false assumption.” I am not raising funds to do the stretch goals, I’m raising funds to do “The City on the Edge of Foreclosure.” The $600 goal (as stated in the campaign) was to raise the money for making the Blu-rays…not the film itself. Selling all 250 of them will give me the budget for the movie…whether as pre-sales or post-sales to recoup. The stretch goals just make the Blu-rays more attractive to have, so the extras are a “thank you” for helping me reach my ultimate goal faster. JONATHAN – Ah, now I’m starting to get it. So you really need to make a lot more than $600…either up front or later on after it’s done? MARK – Exactly. The best case for the movie is that I raise around $6,000. That’s always been the plan from the beginning. In order to reach that, I’d need to sell around 250 Blu-rays. I want to make “City on the Edge of Foreclosure” look great, and rendering time is one of the the costs of doing that. The reason why those last two stretch goal extras are at the high end is that they would require a rendering farm to re-render every frame of two other movies in HD. I remember some really high render times on the Vulcanine set that will grow to astronomical when rendered in 1080. JONATHAN – Can you explain to the readers who don’t know: what is a rendering farm? MARK – It’s simply adding more computers to increase the workload. Let’s pretend that an average frame takes 1 hour to render. There are 24 frames in a second, so one computer could render one second in a day. If this movie were exactly 15 minutes long, it would take me 900 days to render it. JONATHAN – That’s two and a half years!!! MARK – Yep. But f I add a second computer, then I can render 2 seconds in a day. Three computers, 3 seconds a day, etc. In reality, I can make use of core processors to have each computer doing multiple frames and get the rendering time down to months instead of years. JONATHAN – And THAT’S why the stretch goals are so high relative to the original $600 goal! MARK – Computers cost money, of course, and consume a lot of electricity when they are rendering 24 hours a day. And I have to buy licenses of the software for each, etc. I can’t say what the actual cost will end up being, but it won’t be cheap. There are shortcuts that can be taken, but I’m hoping to avoid having to take them when I can. I’d also like to be able to have an original score composed for the film. My hope is all 250 Blu-rays will get claimed in the Kickstarter (there’s still over 200 left), and that will give me what I need to make the movie I want to make. JONATHAN – What does the future hold beyond “Foreclosure”? 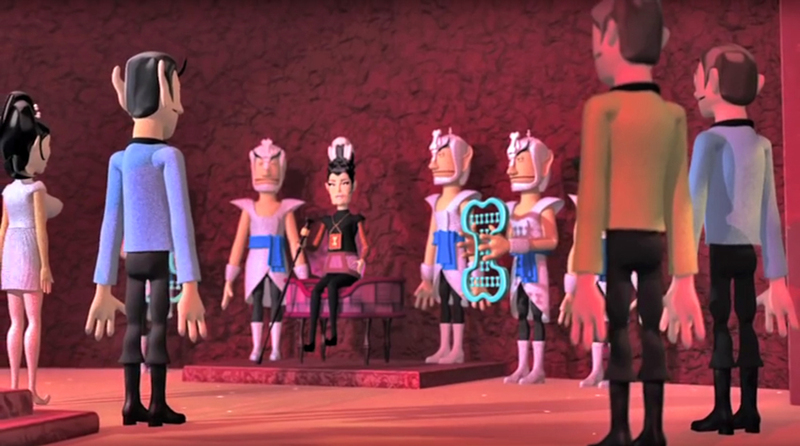 Will fans of Stalled Trek have to wait another six years to see episode #3? MARK – Honestly, I don’t know. I can tell you that it’s exhausting to make one of these. As excited as I am to see it come to life, I know there’ll be a lot of sleepless nights and it takes a toll. I wish I could immediately jump into another one, but that’s just not the case. I’m keenly aware that I won’t have the time to do all of the projects I’d love to do, but it usually works out that something boils to the surface. And after a year or so, the sleep deprivation starts to wear off, and I foolishly jump headfirst into another one! JONATHAN – Well, no rush and no pressure. I just think there’s a lot of people out there who will be very happy to see more Stalled Trek whenever you and your rendering farm are able to make some. MARK – That’s a very cool thing! I think we’ve all had ideas about things we’d love to create, and it’s hard to find the energy and the will to do all the really hard work it takes to make them real. Getting encouragement from people who are excited about what I’m doing and who’ve enjoyed my prior work is really a boost. The money may be small, but the goodwill is enormous. 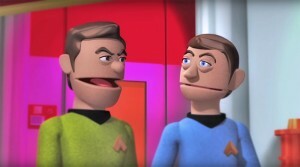 And maybe I’ll find some new people who get a kick out these little animated puppet parodies of mine. Just pledged for the Blu-ray and shared on Facebook. Watched both previous Trek puppet parodies yesterday while reading the 1st half of the interview. Couldn’t stop chuckling! Thanks, Catherine. Mark really is quite brilliant comedically. I love all of Mark’s work, it is funny, well thought out, and with everything else I love, I can never get enough of it! So this is going to be great! I really can not wait to see it! I really hope Mark hits all of his “Warped Goals”, as well!! It would be really cool to see those remastered versions of his other works! I got my donation in and support Mark all the way! Oh, you HAVE to do “Balance of Terriers!! !” I’ve got two dogs named ‘Bishop’ and ‘Ripley.’ Dog owners will love you forever!!! With a title like that, you could crowdfund $6k in a week . . . .
Much thanks, Catherine and Trey! I really appreciate the donations and kind words! As I type this on Saturday night, folks, Mark is just $74 away from his first stretch goal! 18 days to go!!! 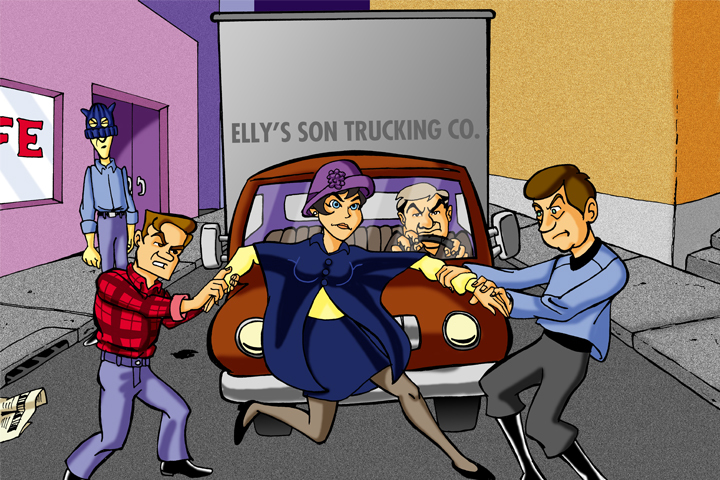 Next Next post: GARY GRAHAM’S “Sons of Kirk” KICKSTARTER enters its final TWO-DAY push!